On the eve of TSX annual results for 2017 being released, new data from CanOils reveals that almost 1.1 million barrels per day of oil and NGL were covered by hedging contracts in the fourth quarter. 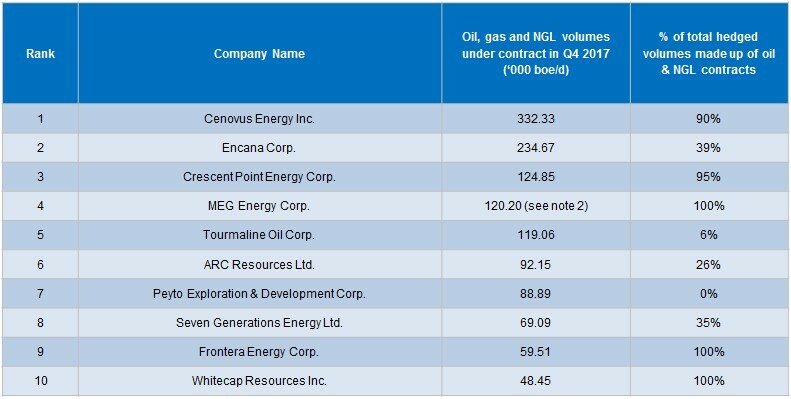 Cenovus Energy Inc. led the way with 299,000 bbl/d of oil and NGLs hedged heading into Q4 2017. Encana Corp. was the largest natural gas hedger with contracts in place for 865 mmcf/d of natural gas in Q4 (a volume equivalent to 92% of its Q3 2017 gas production). 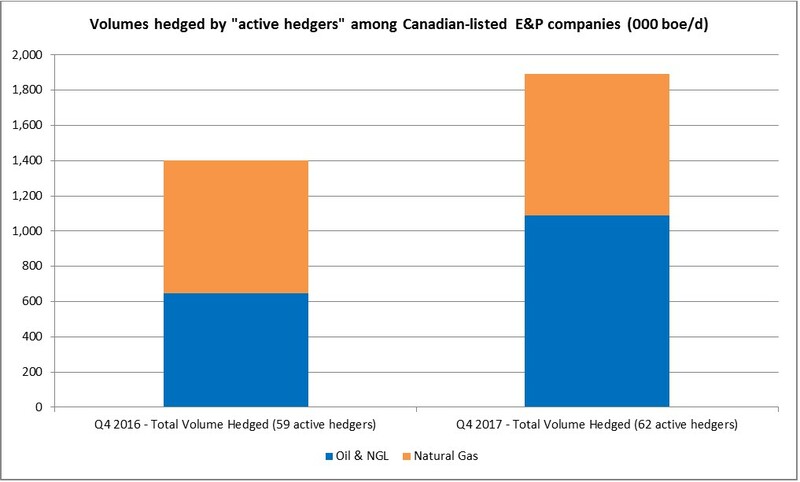 By isolating hedging details released by Canadian E&P companies in Q3 filings, CanOils identified a group of 62 ‘active hedgers’. CanOils defines this group as companies heading to the next reporting period with more than 10% of their production portfolio under hedging contracts. Combined, these ‘active hedgers’ had 1.1 million bbl/d of oil and NGLs plus 4.8 bcf/d of natural gas volumes under hedging contracts heading into the fourth quarter – a combined total of almost 1.9 million boe/d hedged. This is a 35% increase on volumes hedged by the equivalent group of hedgers from this time last year (see note 1). The CanOils hedging database enables contract-by-contract analysis of every hedging contract put in place by Canadian-listed upstream companies. Users can dissect the terms of every active hedging contract and review locked-in oil and gas sales prices years into the future. To request a demo of the database, click here. Source: CanOils Hedging Database – All hedging figures for the above periods are sourced from Q3 2016 and Q3 2017 reports, respectively. 1) The group of ‘active hedgers’ altered significantly since this time last year. Nine companies joined the group having either adjusted their strategies to cover more than 10% of their portfolios with hedging contracts or having been created between the two time periods. Six companies departed the group between Q4 2016 and Q4 2017 due either to corporate sales processes, stock market de-listings or changes in hedging strategy. The groups for both time periods include Canadian-listed companies that have their entire production base overseas. New companies: Athabasca Oil Corp., Birchcliff Energy Ltd., Chinook Energy Inc., Hemisphere Energy Corp., Pine Cliff Energy Ltd., Pinedale Energy Ltd, Razor Energy Corp., TransGlobe Energy Corp., Zargon Oil & Gas Ltd. Removed companies: Ithaca Energy Inc., Kelt Exploration Ltd., PetroShale Inc., Questfire Energy Corp., Rooster Energy Ltd., Trilogy Energy Corp.
2) MEG Energy Corp. also hedged 15,150 bbl/d in condensate purchases heading into Q4 related to its diluent needs. These volumes are not included in this table, but details on the contract and similar contracts for other companies are accessible via a CanOils subscription.